Washington was well aware of the symbolism of personal attire. When the Second Continental Congress assembled in Philadelphia in 1775, he was the only delegate in military uniform, for he wished to demonstrate Virginias willingness to aid Massachusetts, already fighting British troops. 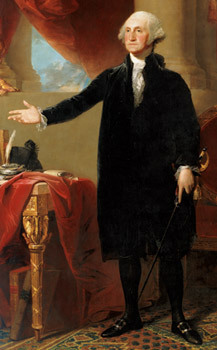 For a portrait of Washington, who was so frequently painted in military uniform, the depiction in a suit symbolized a switch in his public role from general to President. At his first inauguration in 1789, he had worn a brown suit of broadcloth from Hartford, Connecticut, with eagle-adorned buttons. The attire reflected the complexity of the new idea of an American President. He chose to wear American-made clothing, rather than attire made in Britain. The eagle was a symbol of the new nation. In the Lansdowne portrait, he wears, as a second-term President, a formal black suit more suitable to his station. The decision to portray Washington in a formal black suit emphasized his status as a citizen-leader, as opposed to a monarch. Citizens of the new nation, once subjects of a king dressed in royal robes, needed to see that Washington was a different kind of leader. Washingtons plain attirereflecting his own beliefs about the Presidencygave his fellow citizens a visual representation of this new form of leadership: one who is elected of, by, and for the people. Stuart may have been relying on his memory, reputedly extraordinary, to paint this aspect of the portrait, but for some reason he makes the two sleeves different. The right sleeve has the smooth close fit that was the fashion of the time, but the left sleeve is too full.